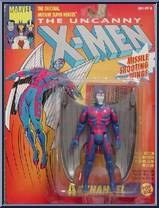 Archangel is the high-flying X-Man with a knock-out secret weapon-- wingtip darts filled with paralyzing fluid! Archangel can fire these darts with uncanny accuracy from any height and speed. With his amazing metal wings, Archangel is able to fly faster than the speed of sound and silently attack like a striking eagle. 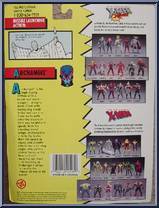 This ability strikes terror in the hearts of evil mutants, for their first warning of Archangel's attack is usually the impact of one of his darts! Contribute pictures, update details or suggest corrections for Archangel (Gray Wings). Write a review about Archangel (Gray Wings).